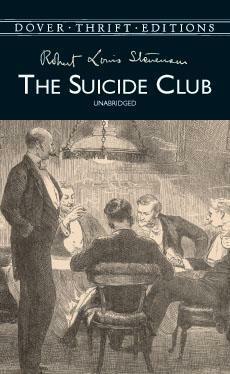 » The Suicide Club — Robert Louis Stevenson. Been a while since I last reviewed a book. Hm. The story follows Prince Florizel of Bohemia and his friend Colonel Geraldine, who encounter a young man giving away cream tarts. They soon learn that he has completely lost the will to live, but cannot end it himself. So he joined the Suicide Club, which is literally what it sounds like. It is a club where its participants get a chance to have an "accident" staged that will kill them. The role of the executor is given to one of the participants as well. Florizel and the Colonel join the ranks to figure out what the deal is, and of course things like that never go well. The novel is divided into three parts — "Story of the Young Man with the Cream Tarts", "Story of the Physician and the Saratoga Trunk", and "The Adventure of the Hansom Cab". The part I enjoyed most is the first one. It was truly captivating and interesting. The whole idea of a Suicide Club is amazing and could have been taken even further. But Stevenson did a great job nevertheless. The second story was quite boring and the protagonist appeared very weak. The third was better, but not as good as the first one. I somewhat wish that Stevenson worked more with the first part of the book and made it into a whole novel of the Suicide Club and its activities. I did not feel like I would have missed out on anything by not reading the last two parts. » Chosen — P.C. + Kristin Cast. » Felidae — Akif Pirinçci. » The Silence of the Lambs — Thomas Harris.